Bonsai is a process not a plant, there are no magic properties in the tree, no genetic engineering or dwarfing hormones so selecting-trees from your local nursery or garden centre is just fine. 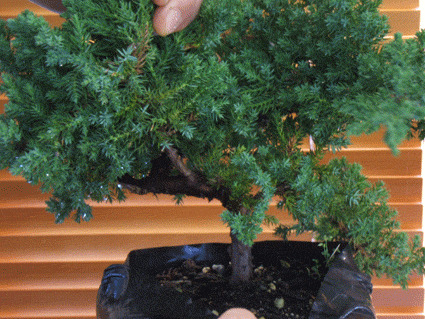 It is possible to bonsai almost any tree, although some are more suitable than others. Once you gain confidence you can experiment with different plants but for this exercise select a plant from the following list. Try to find one that grows well in your area and is easily obtainable, this will mean you have a wider group to choose from. Don't be put off by the Latin names, the Latin names are the same world wide and if you take this list to your nursery they will point you in the right direction. From this list I find the Juniperus procumbens 'Nana' and Ulmus parviflora both make excellent bonsai and are easy first trees, but again select a tree that grows well in gardens in your area and is easily obtainable. 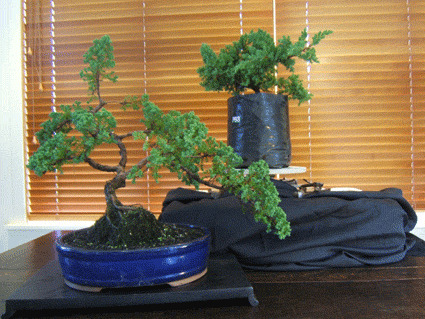 People new to bonsai tend to look for trees that have been left in the pot too long or are distorted in some way, these trees are invariably stressed or diseased and are to be avoided. A bonsai is not a deformed tree, it is a styled natural looking tree, always select healthy fresh stock (Good stock good tree). Secondly, don't forfeit health and structure for an extra few years of age, start with a tree that is small enough for you to manage easily. There must be low branches and they should be healthy. The first and thickest must be about one third of the way up the trunk. This doesn't mean you can't trim small branches off below this or reduce the height of your finished tree. If you have selected a variety from the list, the leaves should be small and in proportion but for future reference take a look, it's no good starting with a tree with large leaves, they will be difficult to change and rarely look right. Even with nursery stock there may be some variance in leaf size if grown from seed so have a look. Try hard to meet all these requirements if you can, it doesn't have to be perfect though. Some of the plants I originally could see no future for are now amongst my favorites. The thing is, there is no right and wrong, it's your tree and if you think it looks right it probably is. I know it's tempting just to look at the pictures and not read the text and while this is a great way to learn, please take the time to read the text above before moving on to the next stage. 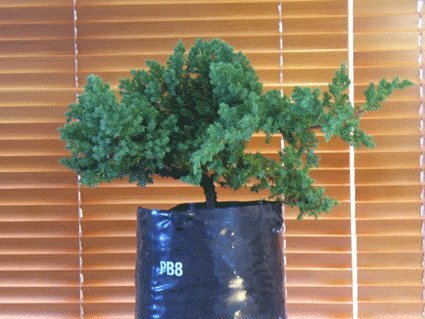 This is a Juniper procumbens 'Nana' probably one of the most popular first bonsai plants. Very popular with the so called Mallsai producers as they look good even if no thought goes into its creation. A little bit of care and training will produce a great tree that will improve with time. This tree is in a PB 8 bag (plastic bag size 8) and cost NZ$8.00 to buy. Here is another view of the plant in the background with a completed tree that was made two months previous at a demonstration at Totara Waters. This is an idea of what I hope this tree will look like when complete. Notice the tree to be worked on is on a banding wheel, this is a revolving wheel. It helps but is not necessary when you are first starting out. They can be purchaced from any pottery craft supplier, or you can make one out of an old revolving office chair or the like. I chose this plant because of the interesting bend in the trunk and the abundance of branches that start quite low on the tree. I have also had a dig in the soil and found the main roots don't start until quite deep which will give me a longer trunk to work with. Juniper procumbens 'Nana' naturally grow as a ground cover and in most cases some wiring will be required. This page should have opened in a new window and the Make a Bonsai page should be still open on your browser if you have your tree ready go back and move on to the next stage . If you don't have a plant yet get out and find one to have a go on remember to try to meet as many of the above requirements as possible. Don't go for the most expensive tree in the place it is nerve racking enough without risking the grocery money on your first tree. You will be a lot more assertive and creative with a cheaper tree and the results will be better for it. If you are ready to move straight to stage two you can follow the link below.